Jason Plato and Mat Jackson took a win apiece for Chevrolet at Knockhill as the HiQ MSA British Touring Car Championship headed north of the border for rounds 19, 20 and 21. In race one Jason led the race all the way from lights to flag in his Racing Silverline Chevrolet just ahead of fellow BRDC Full Member Gordon Shedden, who was really on home ground at the family-owned circuit. Mat Jackson started his day off in style with his first visit to the podium in third place while Colin Turkington’s off-track excursion in the Team RAC BMW left him in fourth. 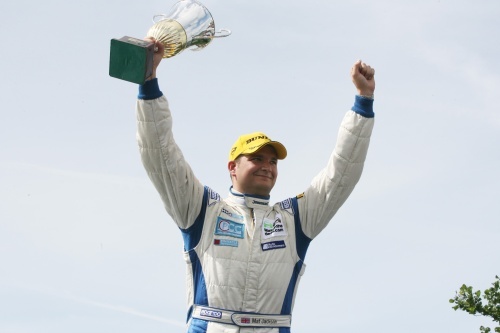 While the BRDC Superstar pairing of Jonny Adam and Andrew Jordan were in fifth and seventh respectively, Paul O’Neill was the next highest BRDC Full Member finisher in ninth place. Tom Chilton finished in 11th in the Team Aon Ford Focus but James Thompson and Matt Neal’s first races both finished in DNFs. In race two Mat Jackson’s impressive form continued with his second visit in as many races to the podium in second place just ahead of Colin Turkington who had made good use of the safety car period to pounce into third place on the restart. Paul O’Neill’s impressive form at Snetterton seems to have remained with him as he finished race two in fifth, just ahead of Team Dynamics James Thompson. With Superstar Jonny Adam in seventh, BRDC Full Member Stephen Jelley was just over three seconds behind him in eighth. Gordon had led the start of the race in front of his home fans but was first challenged and past by Mat Jackson and then later eventual winner Fabrizio Giovanardi. Gordon was to finish the race in ninth place just ahead of Andrew Jordan while Tom Chilton was 11th. Jason Plato’s second race ended in misery as he had to pull into the pits at the end of the green flag lap. The 42-year-old did manage to get back out on track again, but this was short lived as his Chevrolet Lacetti ground to a halt half a lap later. Mat Jackson topped off a great day with a victory in race three as he dashed through to take the lead after the initial battling front pair of Matt Neal and James Thompson touched on lap 17 and the pair lost momentum. The story of the race though was Jason Plato’s storming run from the back of the grid through to second place. The next BRDC Full Member to finish was fourth placed Matt Neal just ahead of Colin Turkington while James Thompson finished in sixth. Tom Chilton gave the Arena Ford Focus its best finish of the season was just behind Superstar Andrew Jordon in eighth while Paul O’Neill finished nineth in the Sunshine.co.uk Honda Integra. The final finishing BRDC Member was Stephen Jelley in tenth. Earlier in the race there was a heavy impact for Gordon Shedden who went hurtling into the tyre barrier and brought out the safety car while fellow Scot Jonny Adam was forced to retire after his fire extinguisher went off in his Airwaves BMW 320si. There were two strong victories for the BRDC at Knockhill in the Porsche Carrera Cup with Full Member Michael Caine taking the first race and Rising Star Tim Bridgman victorious in the second. In race one Michael Caine took the spoils in an enthralling race on a wet track, which was rapidly drying, with Michael’s slick tyre choice proving correct. Tim Bridgman and Tim Harvey initially lead the pack but as their wet tyres began to go off, it was Michael who came through for victory. Tim Harvey eventually finished sixth just ahead of Tim Bridgman while another Rising Star on track, Tom Bradshaw, was ninth. BRDC Full Member Tim Harvey looked as if he might sneak a win in race two, but Rising Star Tim Bridgman had other ideas as he swept past Harvey on lap three before eventually taking victory. With Tim in a solid second, Michael Caine finished his race in third, just ahead of Rising Star Tom Bradshaw.